From safety goggles to ear plugs, we carry everything you need for a safe working environment! Call Timp Rental Center for all your safety supply needs in Orem, American Fork, Provo and Utah County! With our two rental store locations in Orem & American Fork UT, Timp Rental Center offers an extensive inventory of supplies for hardwood flooring, finish & sand paper, carpet cleaning & shampoo. At Timp Rental Center, we also carry a large selection of concrete cleaning abrasives and diamond blades! 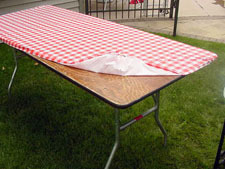 Call us today to for all of your concrete cleaning supplies in Provo and Utah County! 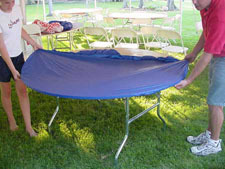 We also carry Kwik-Covers, an easy-to-use, plastic with elastic, fitted table cover that will not blow away in the wind!